Japanese Episode AG 193: "The End of a Journey and the Beginning of a Journey!" American Episode 463: "Home Is Where The Start Is!" The results of the Toneriyu special Pokemon Contest have been revealed! Both Satoshi and Haruka are declared the winners, so they take the single Toneriyu ribbon they both earned and cut it in half, taking one part with them. After the Contest, Haruka announces that she will go to the Jouto region by herself to compete in the Pokemon Contests there. Everyone is happy with the news except Masato, but Satoshi has a heart-to-heart with him that turns him around on the idea. Afterwards, Haruka and Masato board the boat for the Houen region and thank Satoshi and Takeshi for being such good traveling companions. Before long, the time for Satoshi and Takeshi to part ways comes as well. Now that Satoshi is traveling alone, the Rocket-Dan decide that this will be the perfect opportunity to kidnap Pikachu. They're soon distracted, however, by a much rarer site; an Elekibull, a pokemon that can only be found in the Shin'ou region! Satoshi catches the trio trying to capture it and prepares himself to battle, but the Elekibull's trainer interrupts him. Much to Satoshi's surprise, the trainer is his old rival, Shigeru! Shigeru makes quick work of the Rocket trio and then heads back to Masara Town, promising to battle Satoshi when he arrives. The young trainer eventually makes it to his hometown where he is greeted by his family and friends. He and Shigeru waste no time in commencing their battle, but Shigeru's Elekibull is able to defeat Satoshi's Pikachu with a powerful Thunderpunch. After Shigeru lectures Satoshi about becoming too confident after his win at the Battle Frontier, he returns to the Shin'ou region to continue his work. 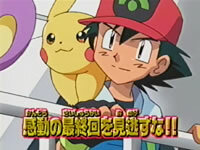 Satoshi then declares that he will go to the Shin'ou region as well and immediately begins to prepare for his journey. After leaving all of his pokemon (except Pikachu) behind at Orchid-Hakase's lab and obtaining a new Pokemon Zukan, the young trainer boards a ferry to the Shin'ou region. Both Aipom and the Rocket-Dan all appear on the boat as stowaways as well, anxious to see what new adventures await in the new land. Now this is more like it. After the utterly horrible series finale we got at the end of the original Pocket Monsters, it seems like the people behind the anime figured out that the best way to end a series isn't to rush the final challenge and then end it all off with a horrible filler about Normal-type and Ghost-type pokemon. Sure, the stuff with the Rocket-Dan trying to capture Elekibull was a bit useless, but this finale is a big improvement over the last one. Oddly enough, Masato seems to get more of a farewell than Haruka does. I guess the writers figured that they aren't done with Haruka but have pretty much exhausted all their Masato stories and figured that this would be as good a time as any to wrap his story up. I very seriously doubt that we'll ever actually see this promised trainer battle between Satoshi and Masato, but having him have that to look forward to is a lot better than telling him that he's going to be regulated to silent cameos where he combs a Kekking's hair for the remainder of the franchise's life. This is apparently PUSA's season finale even though the original Season 9 finale wasn't supposed to occur for another five episodes. Guess they just felt like cheating Cartoon Network out of a handful of episodes, huh? As far as the dub goes, the music in this episode is absolutely atrocious; whose bright idea was it to replace the Chisaki Mono instrumental during Haruka's farewell scene!? Or, like...the other handful of instrumental pieces that work perfectly in the Japanese version but are tossed out for the annoying synthesizer crap!? On the plus side, Ash's mom no longer seems to have that creepy obsession with her son's underwear. Thank God for that. From the start of the scene where the Rocket-Dan gets fired all the way until the show goes to commercial, the first series' twelfth ending theme, Maemuki Rocket-Dan, plays in the background. This energetic song is replaced by a bunch of forgettable dub music. Jessie: "A new Pokémon and we've got it!" James: "Wait til the boss sees how ahead of the curve we are!" Jessie: "Trendsetters make big bucks!" Originally, Musashi excitedly talks about how they've snagged a pokemon they've never seen before, prompting Kojirou to wonder whether or not their boss had ever seen it, either. This wondering about whether or not the boss has ever seen an Elekibull before isn't present in the dub. Like I said...it's only a little different. During the big Satoshi vs. Shigeru fight in this episode, Mezase Pokemon Master 2001 plays throughout the duration of the battle. This is, of course, replaced in the dub. But y'know...it wouldn't have killed PUSA to have put in the English equivalent of the song (which would be the remix of the first opening theme used for the Celebi movie)? Or shoot...even their Battle Frontier opening would have been better. Something to make the battle stand out. Ash: "Awesome! Alright, Sinnoh Island! Look out! You'd better get ready for us!" Even though Shin'ou is an island, "Sinnoh Island" is not the name of the place. Originally, Satoshi calls it the Shin'ou Region like everyone else. The NEXT TIME...A NEW BEGINNING! screen is extended by three seconds for the dub. And no, typing NEXT TIME...A NEW BEGINNING instead of TO BE CONTINUED... doesn't make reporting this edit any less tedious.